Is specially developed for periodic cleaning of coolant tanks. The simplicity in design translates into its high user friendliness. The simple operations of the unit are assisted by a single access hose, twin filters, clean coolant tank and a special vacuum / pressure blower. There are no manual intermediate valves to be operated. A specially designed 4-port valve helps the clean coolant tank to be either in suction or discharge mode. 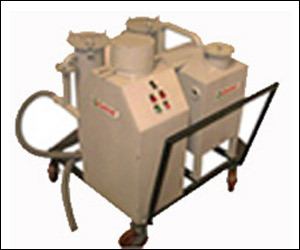 Required safety interlocks are provided to ensure safe operations of the system. Access hose is dipped in the dirty tank. Clean coolant tank is brought in vacuum mode by manually operating 4-port special valve. Dirty liquid gushes in clean coolant tank through two stages of filters. The emptied dirty tank is cleaned manually of any traces of liquid and muck deposited at dead spots. Clean coolant tank of CRM-100 is brought in discharge mode. Cleaned coolant rushes back to the coolant tank of the machine. The filter elements are of reuse type. They are cleaned manually and fitted back for next set of operations on another machine.